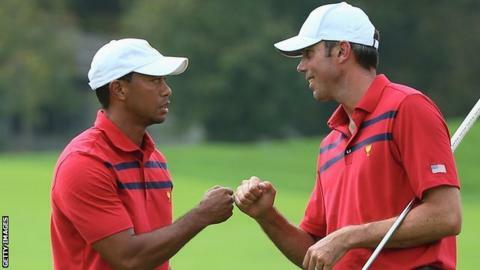 World number 11 Matt Kuchar says the Masters will not suffer despite the absence of Tiger Woods next week. Four-time champion Woods will miss the Masters for the first time in his career after having surgery on a pinched nerve in his back. "It's the Masters," said Kuchar, who was eighth at Augusta last year. "It's still the greatest golf tournament." Woods aggravated his back in March's WGC-Cadillac Championship after withdrawing from the Honda Classic. The 38-year-old, who will be absent from the Masters for the first time in 19 years, won his maiden Augusta title in 1997 and also claimed the Green Jacket in 2001, 2002 and 2005. Kuchar added: "Certainly, the Masters will not suffer. It's definitely exciting. "I think everyone wants Tiger to be healthy and playing well and in contention. Most guys dream of taking Tiger down, battling him down the stretch at the Masters. We won't have that chance this year but we'll still have a chance to don a Green Jacket." "We experienced a year without him. He is the centre of the PGA Tour sphere. "He attracts the most eyeballs, the most attention, but there are a lot of great players out here and I think the Tour held on quite well, stayed pretty healthy, while he was absent. Fellow American Stewart Cink, the 2009 Open champion, said that the sport had enjoyed high-quality tournaments in the past without Woods, citing his absence in 2008 while he recovered from knee surgery. Cink said: "It will be a little different without him, but it's still a great tournament. "We played, back in 2008, a lot of majors in a row without him and they were still great tournaments, and the Masters will be great." "Knowing the way he thinks and reacts, he's going to find the easiest way that he can to swing with his back, which will probably mean he makes some changes to his swing," Haney told the Golf Channel.